Activism and Counterinsurgency at the End of the British Empire, Cornell University Press 2018. “In Brutality in an Age of Human Rights, Brian Drohan demonstrates that British officials’ choices concerning counterinsurgency methods have long been deeply influenced or even redirected by the work of human rights activists. 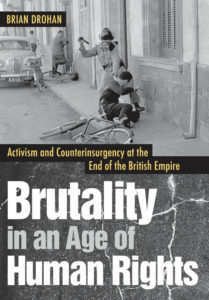 To reveal how that influence was manifested by military policies and practices, Drohan examines three British counterinsurgency campaigns—Cyprus (1955–1959), Aden (1963–1967), and the peak of the “Troubles” in Northern Ireland (1969–1976). This book is enriched by Drohan’s use of a newly available collection of 1.2 million colonial-era files, International Committee of the Red Cross files, the extensive Troubles collection at Linen Hall Library in Belfast, and many other sources. This entry was posted in Actualités / News, Books and tagged counterinsurgency, Human Rights, ICRC by Fabian Klose. Bookmark the permalink.